As it did with the cyber-hobby.com spinoff of its 1/35 scale Ka-Mi kit, DML has now “shrunk” their pontoon-equipped version to 1/72 scale with great results. 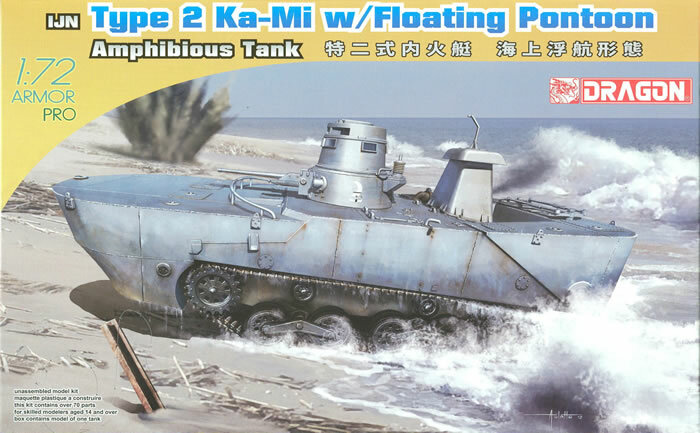 As noted before in the review of that kit, the Japanese had a unique approach to amphibious tanks. While they made their amphibious tanks much larger than their land-based counterparts like the Type 95 Ha-Go, they simply attached large pontoons at the front and rear to give them the sea-going buoyancy they needed. The Type 2 Ka-Mi (a 1942 design) was one of the more prolific ones, with about 185 of them being built during the war. It did mount a 37mm cannon and two 7.7mm machine guns, one of which could only be used when the bow pontoon was dropped. The vehicle weighed 13 tons with the pontoons mounted, and 10 when they were dropped. Using mechanical components from the land-based Type 95, the Type 2 used a new hull design with pontoons held in place with “claw” type clamps that could be jettisoned from inside the tank when the vehicle no longer needed them. Divided into separate compartments, the pontoons gave excellent buoyancy at sea and proved to be effective. However, like its Soviet counterparts, the tank portion proved to be quite vulnerable to enemy antitank measures and could be penetrated by everything in the US arsenal above .30 caliber. Coming in to service too late to be effective in its design beach reconnaissance and assault functions, the Type 2 tanks were forced to fight on land which was not their strong suit. As a result, they were encounterd by US forces starting in 1943 who quickly eliminated them where encountered. Only a single example captured by the Soviets (with its pontoons!) exists today in the Kubinka Museum in Russia. As it now comes with the bulky pontoons, the new version is a much larger vehicle and will be about the size of a Tiger II when completed. The kit replicates the previous release (No. 7435) but adds a new supplemental “A” sprue of 18 parts with the bow and stern pontoon sections, the wading intake and control tower, and all necessary fittings. As they have been molded complete, and not simply “stick-on” parts, the modeler may show the model in the process of dropping its pontoons for combat which is a nice option. This kit has the road wheels as two piece bogie assemblies with all other wheels being separate. The lower hull is slide molded with all details in place for the suspension mounts. The upper hull is nicely done with “see-through” grilles on the engine deck. Propellers and shafts are separate parts and very petite, but none of the “claw” assemblies of the larger kit are provided. While the 7.7mm machine guns are complete, and part of the turret race is replicated, only a barrel is provided for the main gun. The exhaust guard is provided as an etched brass grating, however. The DS Tracks once again now come with an installation guide noting they should be 137mm long for proper fit. The ones in the review sample were right at 137mm. Three (to six) marking options are provided, all vehicles grey: Vehicle 101, Kwajalein 1944 (grew with moon and arrow markings, white 101); Vehicle 105, Papua New Guinea 1944 (white 105 in three places); and Vehicles 601 to 604, Papua New Guinea 1944 (appropriate numbers in three positions). Decals are a tiny targeted set from Cartograph. Overall this matches its cyber-hobby.com “big brother” for quality and should be a popular model to match the previous DML Type 95 and Type 97 models in 1/72.